Osmosis: Positive inotropic medications. (2019, April 20). 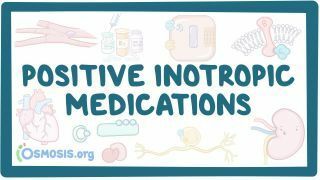 Retrieved from (https://www.osmosis.org/learn/Positive_inotropic_medications). Digoxin is a cardiac glycoside used in heart failure to increase cardiac contractility and decrease heart rate. It directly inhibits the sodium/potassium ATPase pump, causing indirect inhibition of the sodium/calcium exchanger pump and leading to increased intracellular levels of calcium. This increases contractility. It also directly stimulates the vagus nerve to decrease heart rate. Side effects are mostly cholinergic, and include blurry vision with yellow haloes around objects, arrhythmias (most common cardiac side effect), and AV block. Hyperkalemia in a patient on digoxin indicates a poor prognosis. Hypokalemia predisposes to digoxin toxicity, as do renal failure and certain drugs like amiodarone, verapamil, and quinidine. Treatment of overdose is by slowly normalising potassium levels, cardiac pacing, magnesium infusion, and anti-digoxin Fab fragments. is a trace element that is used to treat digoxin toxicity. A 75-year-old woman comes to the emergency department because of nausea and vomiting, abdominal pain, double vision and describes seeing green/yellow outlines around objects. She reports a history of NYHA Class III heart failure, atrial fibrillation, and bipolar disorder. Her current medication list is quite extensive and includes ramipril, bisoprolol, spironolactone, digoxin, amiodarone, and lithium. Which of her medications is most likely to be responsible for her symptoms?